Sets let you organize your photos on Flickr. Explore the 19 photos in this set. Clayoquot Sound – 136 – Not Out Of The Woods Yet! NOTE: Greenpeace link broken, original article accessed via Archive.org Wayback Machine shared here for the record. Clayoquot sound is a magnificient area of coastal temperate rainforest located on Vancouver Island. The area is home to ancient Western hemlock, Sitka Spruce and Western red cedar up to 1,700 years old and 300 feet tall. A diverse array of wildlife thrives in the area, including Roosevelt elk, black bears, wolves, orca and grey whales, salmon, migrating waterfowl, shorebirds and the endangered marbled murrelet. Clayoquot Sound is one of the largest unlogged areas remaining on Vancouver Island and one of the largest areas of temperate rainforest remaining on earth. Of the earth’s original temperate rainforests, 50% have been destroyed in the last century. Of the world’s remaining temperate rainforests, 25% are in British Columbia. Three years ago, the B.C. government announced that 62% of the land area in Clayoquot (74% of the old-growth forest) would be open to clearcut logging. Over one-quarter of Clayoquot Sound has already been clearcut. Most of the wood is shipped to other countries to produce garden furniture, newspapers, magazines and phonebooks. In the wake of the government’s decision, national and international protests broke out. 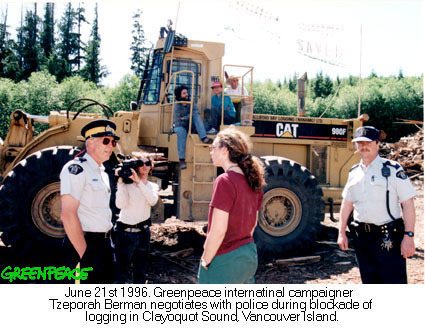 Over 10,000 people came to Clayoquot Sound in 1993: 857 people were arrested that summer trying to stop the clearcutting. Some of MacMillian Bloedel’s European and American customers cancelled their contracts to protest MacBlo’s role in the clearcutting. Greenpeace has encouraged individuals and companies to join the struggle. More than 30 of Canada’s best-known authors have spoken out to condemn clearcutting. Dozens of Hollywood stars including Oliver Stone, Tom Cruise, Barbara Streisand and Robert Redford have joined the campaign. The publishing house Knopf Canada and one of Canada’s largest school boards, along with Germany’s largest publishing houses, have publicly announced that they would prefer to use clearcut-free paper. Clearcutting is an ecologically disastrous practice which destroys the original forest ecosystem, leading to habitat loss, soil erosion, bare mountains, landslides and devastated fish streams. It was clear that very few people want to see this happen in Clayoquot, or anywhere else in Canada. In response to the international outcry, the B.C. government created a panel of First Nations people and scientists to determine what would qualify as acceptable logging in Clayoquot Sound. After almost two years, the Scientific Panel made over 100 recommendations, including an end to clearcutting in Clayoquot Sound and a moratorium on any logging or road-building in the Sound’s intact valleys. Reducing the amount of wood cut each year in Clayoquot Sound. These steps move towards protecting Clayoquot Sound, but there are still some unanswered questions. The Panel’s mandate was to consider HOW to log in Clayoquot, not WHETHER there should be any logging. 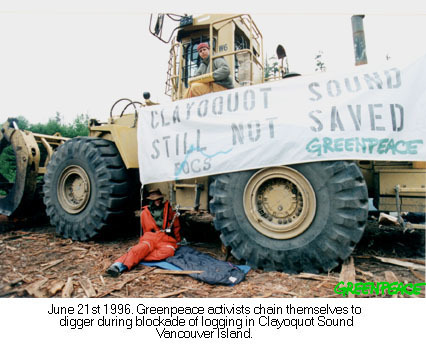 Greenpeace is actively campaigning to ensure that no logging takes place in the remaining intact areas of Clayoquot Sound. The Nuu-chah-nulth people of Clayqouot Sound have lived in the region for thousand s of years and have never ceded their territiories. They have consistently stated their opposition to clearcutting, and Greenpeace is dedicated to supporting them in their struggle to end clearcutting on their traditional lands. 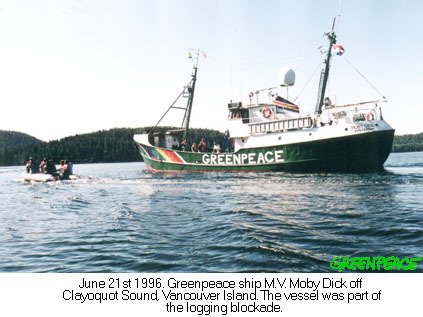 Greenpeace will ask customers of MacMillian Bloedel to use their influence to demand that the timber giant agrees to stay out of the pristing areas of Clayoquot Sound permanently and, effective immediately, that they not violate any of the recommendations of the panel. Throughout the world, we are asking paper and timber consumers to reconsider the ecological impacts of their wood sources and to develop environmental procurement policies that reject wood fibre coming from practices such as clearcutting, or from rare ecosystems such as primary rainforests. A first step is to ensure that their wood or paper is not made from clearcut ancient rainforests. Some of the Scientific Panel’s members have already said that the stringent recommendations made for Clayoquot should apply equally to the temperate rainforest throughout British Columbia. In the coming year Greenpeace will work to protect the biodiversity of these other, equally fragile rainforests in B.C. 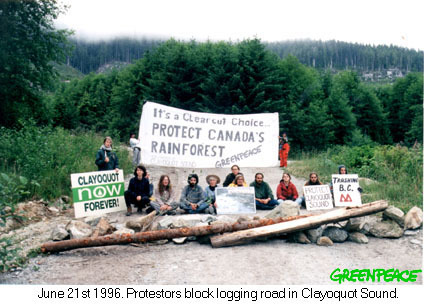 In the summer of 1993, thousands of people gathered in Clayoquot Sound to protect the area’s ancient temperate rainforest, in what would become one of the defining environmental protests of our time….